‘Get Curious’. I make a choice. I pay attention to the trolleys stacked in a snakey line. A caterpillar. I imagine a creature – a living being. It’s moving, clanking, organic. I am instantly refreshed. Instead of walking around with a negative grey steelo pad for a brain, I’ve noticed something ordinary, then played with my immediate perceptions of it. If I were motivated and confident to do so, I could turn this wee fanciful image into a cartoon, a sculpture or a character in a play. It’s a simple, yet powerful injunction. I picked it up in a mindfulness training course. Hmm. Now I’m curious about when in my life I stopped being curious and therefore needed reminding. Do you relate to this? Were you a curious-cat kid? Always asking Why? And then the volume button of your natural wonder and curiosity got switched down to low? Here’s the link to Open Ground mindfulness training in Australia. Deeply recommend. and…‘Get Curious’ leads directly to Flower Power Point Three…coming your way in late July. 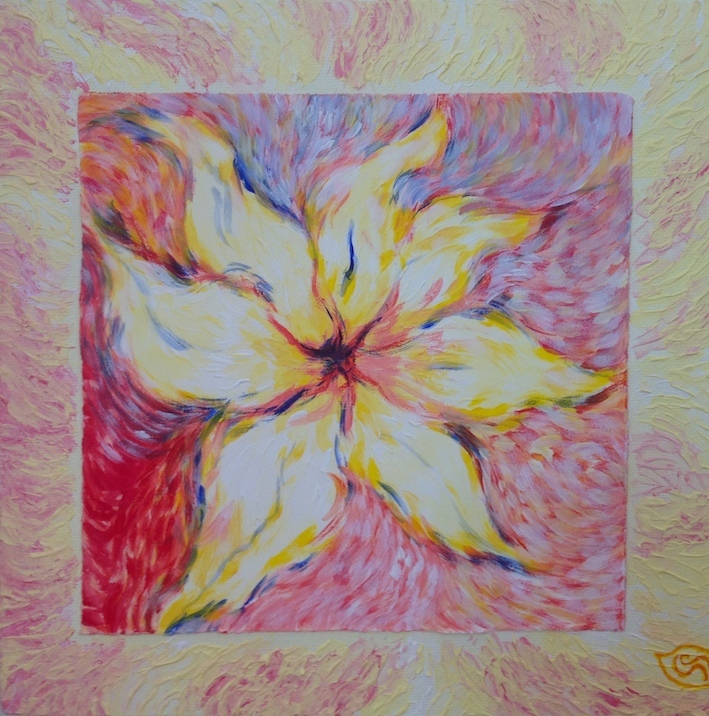 This entry was posted in creativity tips and tagged art, Flower Power Point, inspiration, mindfulness, Open Ground, your creativity by Art and Soul Space. Bookmark the permalink. Very refreshing Sal for someone (Me) who hates supermarkets I now see a different approach. I need to slow down and look where I zoom as fast as I can. Ha! I am imagining you powering along with your trolley. And…glad to provide something refreshing. More refreshment, I say. I never ever want to squash her creativity. The first time you tell a young child her purple and pink tree should be green is the day you begin to close their youthful eye. The tree should be pink and purple because it was those colors that made her heart sing and her hand dance! For her those colors represent her girl power. One boy in preschool told her she scribble scrabbles when she colors. She promptly told him “I do not scribble scrabble.” I love her inner strength and confidence. Mary – what a beautiful story! So glad your little one claims her artist self. And so she should. Hang on a minute…aren’t trees pink and purple? And isn’t scribblescrabbling a rhythmic, lively approach to colouring? Hurrah for you and your granddaughter! She is blessed to have you as a creative, generous mentor in her world.